Catholicism in Colonial America was not only looked down upon, especially during the year prior to the Revolution, but associated with the destruction of liberty itself. As tensions with Britain heated up, the people of America opposed the structure and laws that Catholicism relied on. The colonists were also primarily protestant, with 20.7% being Congregationalist in 1776 and only 1.7% being Catholic. This statistic adds an element of the fear of the unknown since so few colonists were Catholic. It was a fear similar to the fear of the Native Americans who tensely co-existed with the early settlers. When the French began converting many of the Native Americans to Catholicism, this created an even greater aversion to Catholicism. Native Americans were seen as “heathens” and their “popery” (a negative word for Catholicism) was seen as just another way to oppress. In many of the newspapers from 1764 to 1789 (primarily in New England), there was a fear that in America, there would be an attempt to start a system of episcopacy, i.e. a system of church government by bishops, which was not how the early settlers ran their churches at all. Colonial British North America had a system that was primarily run by the men of the village. If episcopacy was brought to America, the settlers saw bishops as just another “King” which would be present to enact more rules and laws to enslave the colonists. Extreme distrust of “popery” and Catholicism in general led to fear from the American people of Catholicism. Glancing at my word cloud visualization, immediately the word heathen jumps out. It is interesting that this is one of the biggest words on the page because “heathen” is a word that primarily means uneducated below human substance. This word was used primarily to describe the conversion of Indians to Catholicism because of the anger felt by the colonists toward not only Catholicism, but also toward the Native Americans who they felt were not worth anything. Racism was a prevalent part of the early 18th century and even still exists today. It was truly a fear of the unknown which caused this derogatory term to be present in many newspapers. It shows fear of the Native American, but also fear of Catholicism, though Catholicism was not prevalent in colonial America. 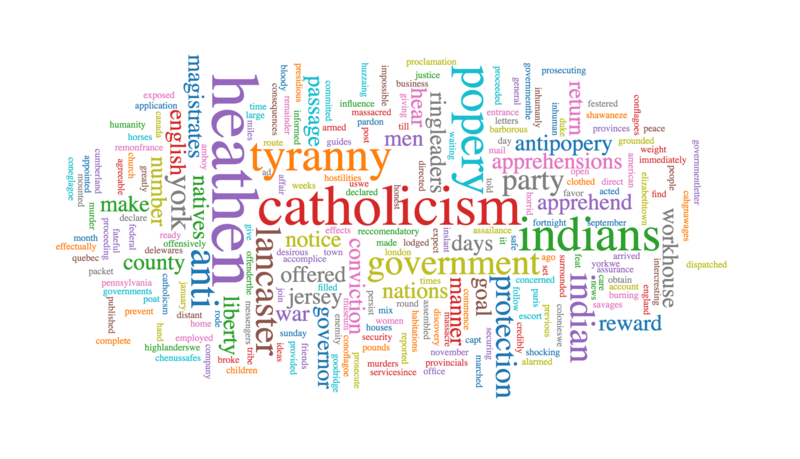 Tyranny was another large word in the word cloud, and this was one of the main focuses of the tension between the colonies and the British. Tyranny, by definition, means cruel and oppressive government or rule. The colonists felt that the British were enforcing a tyrannical government upon them based on the Stamp Act as well as the Quartering Laws, which were around because of the French and Indian War. This tyranny was extended to Catholicism when it was suggested that bishops be put in placed in America. The hierarchy surrounding popery and the Catholic Church itself appeared to the Americans to be tyrannical, just as they saw the monarchy in England. Distrust of the Pope and the Roman Catholic Church made the colonists even more afraid of the monarchy in England and made them turn on Catholicism. They saw all these as infringing upon the liberties of the colonists. 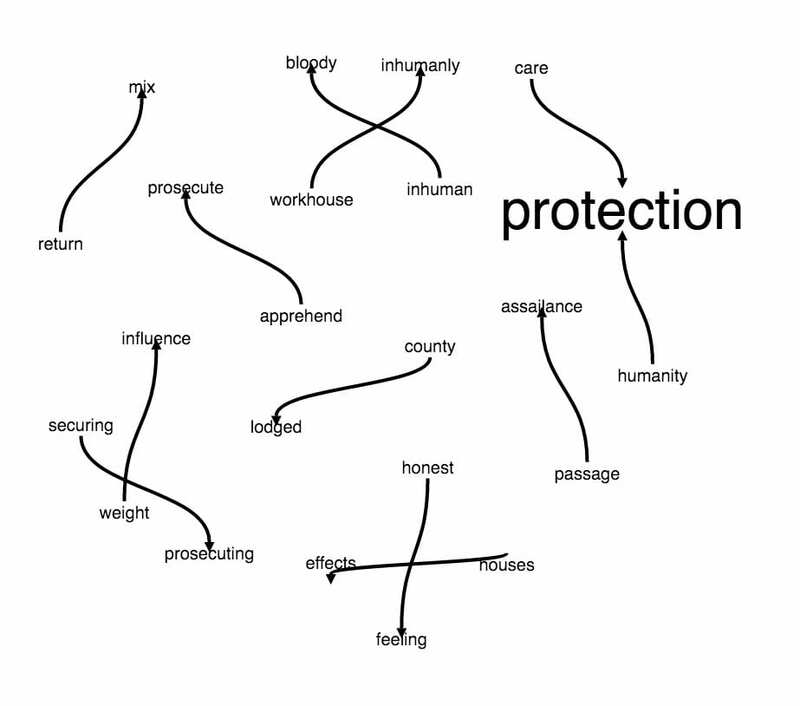 The most prevailing word connection in my phrase net was the connection between care, protection, and humanity. Those who wrote in the articles I used felt that Catholicism was encroaching upon the rights of the citizens of the colonies, much like they believed the same of the the monarchy in England. These words also extend to the fear of the Native Americans, especially when they were converting to Catholicism. Writers rallied the readers of the newspapers by insisting that for the fate of humanity and the care and protection of the humanity, episcopacy must not reach America and the Indians should not be converted to Catholicism. These words also extend into the racism of the American colonies and displayed their belief that Native Americans weren’t even human themselves. The sources I looked at for this project all projected one thing: fear of the unknown and transfer of fear in order to create anger in the entirety of the colonies to attempt to break off from England. This method has been seen throughout history and can be seen now in this election. Donald Trump is the primary perpetrator of this method by creating fear of Islam. Racism is an easy way to achieve a goal because of fear. Fear can move mountains for people, especially people like Donald Trump who can influence ignorance. Catholicism is certainly not as bad as it is thought to be based on the words from the secondary sources. The anger of these colonists primarily stemmed from their fear of oppression based on the actions of the government of England toward the colonists, who had no representation in Parliament. The hierarchy of the popery and the episcopacy was so similar to the English monarchy that the possibility of the episcopacy being implanted in America made the English colonists freak out. They had created their own unique society that was somewhat English but developing into the America we know today. Throughout history, we see this usage of fear to create anger and make goals happen. Hitler was another historical figure who used this method to rise to power. He blamed the Jews for the destruction of the German economy and problems in the German government. Donald Trump is emerging now and utilizing the religion of Islam to be a scapegoat for the issues of America. Now, because many are ignorant to the viability of other religions and other skin colors, racism is very alive in America especially toward Middle Easterners. Not all Catholics were bad in colonial America and not all Muslims are bad in our America. Fear of the Native Americans also came from a fear of an unknown. When someone does not look like you it is easy to immediately expect the worst but when one develops a sense of being open minded, you can see things through their eyes. The fact that this ignorance is coming forth in our nation again based on fear is just another example of history repeating itself. From this blog post, one can learn how to learn from history. Despite over 200 years passing, history continues to have fear, racism, and ignorance. The Native Americans were heavily abused by Americans and are still fighting for rights. If we continue with the trend of ignorance and fear, Middle Eastern people who have immigrated to America will face the same struggles of abuse that were faced by Native Americans. The fear of Catholicism during this time can also be translated to fear of Islam as well, creating a tense environment not friendly to Muslims, much like the environment for Catholics during the 1760s.